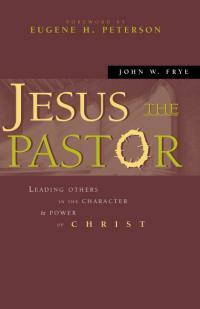 John Frye’s 2000 book, Jesus the Pastor, explores the way Jesus shaped disciples as a model for contemporary ministry. I’m happy to be able to interview John Frye here at Jesus Shaped Spirituality, and I encourage all of you to acquire John’s book. You can also read his blog at Jesus The Radical Pastor. First, I asked John to say a little bit about himself in the biographical department. 1. What was the purpose and message of your 2000 book “Jesus the Pastor?” How would the book be different today? My theological training for pastoral ministry was obsessed with the Apostle Paul and his New Testament letters to the glaring neglect of Jesus and the Gospels. Yet, Paul is never called a pastor nor does he ever call himself a pastor. Jesus is the “good shepherd,” “great shepherd” and “chief shepherd.” So, I wanted to imagine Jesus as the supreme model for pastoral ministry and the Gospels as manuals for pastoral ministry. I wrote the book to put Jesus as the One who most significantly shapes pastoral identity and ministry. I wrote the book during the years of renewal (i.e., the controversial “third wave”), principally through the influence of the Vineyard movement. Like so many others, I was captivated by the renewed emphasis on the Person and ministry of the Spirit. If I wrote the book today, I would not emphasize the renewal aspects so much. I guess I am more post-charismatic than I was at the time, not in terms of being an evangelical non-cessationist, but in terms of zany Christian experiences. I would focus more on Jesus as a first century Jewish prophet during second temple Judaism under Roman oppression (ala N.T. Wright and others). 2. In a sense, the title Jesus the pastor buys into the image that Jesus established the institutional church as most Christians endorse it. I am one of those people who believe Jesus started a movement, but not an institution. What does the movement that Jesus is leading look like? How do we know it when we see it? Because we are all in liminal space, leaving some old ways of “doing church” behind and entering into yet undefined ways of “being church,” I admit that I don’t have definitive or settled answers to these questions. I also admit that the most sane pastoral voice in our era is Eugene H. Peterson. Eugene H. Peterson was “emergent” long before emergent was cool. While believing that the institutionalism of the Christian faith is simply recognizing its fossilization (a danger in any generation), I am not ready to say there is no place for Christian institutions. The reason I like the Evangelical Covenant Church denomination (an institution) is because it has the life, energy and feel of a movement. The E.C.C. community is relationally driven. I believe the church is to be relationally driven, i.e., relationships with God, with one another, with those needing faith, and with creation. I think a relationally-driven Jesus community will emphasize expressions of radical love in word and action, will be uncomfortably embracing of the neglected and marginalized, will care deeply for people and their stories, that is, listen 90% in the relationship and talk 10%. There will be a lot of laughter, too, as we lived relaxed and hopeful in our faith. 3. The emphasis on the reformation doctrine of justification by faith alone has caused many evangelicals to be suspect of any kind of focus on Jesus as an example, as they fear some kind of salvation by works. But the result seems to be very few Christians with any real desire to resemble Jesus in the way he actually lived and ministered. Why is Jesus shaped spiritual formation important, and why isn’t it a threat to the Gospel emphasis on salvation by faith? If we start with James, Jesus’ brother’s book, we might avoid the unnecessary conflict between the life of Jesus as our pastoral and Christian life model and Paul’s emphasis on “faith alone.” The justified life Paul speaks of in practice is simply the continuing incarnation of Jesus in his “second body”–the church. I can’t be like Jesus all by myself. It takes “a body.” We have to destroy the insidious individualism of USAmerican Christianity. I believe in praxis, that is, every behavior is an expression of belief (or theology). We will be evaluated in the end on our works. As N.T. Wright repeats, “We are not saved by believing in justification by faith. We are saved by believing God in Jesus.” Here’s the verse that should rock every Jesus-follower to the core: 1 John 2:6 “Whoever claims to live in him [God], must walk/live as Jesus did.” If I claim to be a Christian, that claim is verified in a way of life-the Jesus Way of life. I must walk as Jesus did; it is not an option. Let me tell you, it takes faith to live the way Jesus lived. I can say all day that I am saved by faith alone, but if my “walk” is not the Jesus Walk, I am a liar and am not “doing” the truth. I might be saying it, but that’s not enough. Two helpful books along these lines are by Scot McKnight: The Jesus Creed and Embracing Grace: A Gospel for All of Us. 4. Eugene Peterson has said that we’ve lost pastoral integrity; that the view of a pastor today is of an entrepreneur, fundraiser, growth consultant, comedian, counselor, media star, etc. What can we do to recover the role of the pastor as shepherd and spiritual guide? USAmerican church daily because of the idiotic thing the church has become. Pastoral integrity is maintained by a single-minded, fierce focus on Jesus Christ. We must immerse ourselves in the Gospels, watching Jesus, listening to Jesus, caring for what he cares for, finding the in-your-face boldness he had against all that diminishes God’s love (hesed) in human relationships. Let’s surround ourselves with people obsessed with Jesus, who will take Jesus at his word, believing that Jesus is brilliant as Dallas Willard has reminded us, and form a community who want to be in their context the continuing incarnation of Jesus on this planet. 5. What are some of the most influential books and authors that have helped you understand Jesus? With Scot McKnight’s books above add his A New Vision for Israel: The Teachings of Jesus in National Context and A Community Called Atonement. Read anything by Eugene H Peterson. His little book Five Smooth Stones for Pastoral Work is a must. N.T. Wright’s books are exceptional, both his BIG ones and his popular, littler ones. Henri J. M. Nouwen’s books capture the Jesus Way and Nouwen wrote so well about it. The Aims of Jesus by Ben F. Meyer; Jesus, The Jewish Galilean by Sean Freyne; Richard Horsley, Jesus and the Spiral of Violence; John Howard Yoder, The Politics of Jesus; Gerd Theissen, The Shadow of the Galilean, and an older classic, The Training of the Twelve, by A. B. Bruce. Yet, nothing surpasses the four Gospels. And, yes, I’d recommend Jesus the Pastor by some guy named Frye. I admit this is something of a non-seqitur, but whoa, I’m digging the image of Jesus with the Winchester in the banner. And…in the background to the right…is that Jesus with a helmet with a US flag on it, holding a hand grenade in one hand, an assault rifle in the other, and a combat knife in his mouth!? Thanks much, Michael, for the interview regarding *Jesus the Pastor. * Blessings! As I spend time on the interent on various blogs about Christianity, I am surprised by the number of people who seem to “prefer” the letters of the New Testament and the books of the “Old Testament” to the Gospels themselves. At least it SEEMS that way to me with the way they always quote from those books. I keep coming back to the Gospels myself because I want to hear and see the words and stories of Jesus himself. That’s where my inspiration comes from in terms of scripture. There is surely beauty and wisdom in the other books too, but I need Jesus. I just finished listening to a lecture by N.T. Wright online and he paraphrases Romans 1:17. I went to Biblegateway to get some versions of that passage and was surprised to see that Eugene Peterson, who John Frye says we should read, is the person who put the Bible translation called “The Message” together. Peterson translates Romans 1:17 as: “It’s news I’m most proud to proclaim, this extraordinary Message of God’s powerful plan to rescue everyone who trusts him, starting with Jews and then right on to everyone else! God’s way of putting people right shows up in the acts of faith, confirming what Scripture has said all along: ‘The person in right standing before God by trusting him really lives.’ ” I see that the NIV writes it as “For in the gospel a righteousness from God is revealed, a righteousness that is by faith from first to last, just as it is written: ‘;”The righteous will live by faith.’ ” Peterson certainly makes that passage more understandable. I am glad that Frye gives Peterson a “thumbs up.” I will feel more “OK” reading translations according to “The Message.” I kind of wondered if The Message was maybe too…..out there…..in its paraphrasing.